See Where the Road Leads: Highway from Hell? Anyone who contemplates driving an RV to Alaska has heard horror stories about the road conditions on the Alaska Highway. Anything from broken windshields to virtual destruction of a rig are common tales. As we were about to venture onto the highway for the first time, I wasn’t sure what to believe. After a not-so-quick stop at the Village Bakery in Haines Junction to partake of some free WiFi, we turned north onto the Alaska Highway. The highway skirts the eastern side of the Kluane Ranges, and the view to our left of the snow-capped mountains was magical. We followed these and other mountain ranges for most of the day. Kluane Lake soon came into view in front of us. This lake is the largest in the Yukon and is said to be the prettiest. As we followed its shore, I had to agree with that assessment (even though I’ve only seen a few lakes in the Yukon). For a brief moment I regretted that we had not made it as far as the lake yesterday. That’s where we had planned to camp last night. I could see spending a lovely and relaxing week camped along the shore. Some other time perhaps. Road damage became more frequent, and pot holes added to the excitement. Construction signs soon appeared, and we were on a gravel roadbed. A safe speed seemed to be about 20 mph, but large trucks and even other RVs decided that we were slowpokes and passed us at high speeds, throwing gravel back at us. The icing on the cake was the near-constant washboard sections of the gravel roadbed. I thought the RV was going to shake apart, even though we were just creeping along. Although I had carefully secured everything inside the RV, an upper cabinet door flew open and Kitty’s food dish, which had been braced, slid across the floor. We finally were able to pull over near the side of the road so I could at least close the cabinet door. What had saved everything from flying out was the tension rod that I always place across the inside of the cabinet. I was never so happy to reach solid pavement. The remaining frost heaves and pavement breaks were like a walk in the park after that horrid stretch of gravel. We began to look for a rest area so we could stop and assess the damage, and we finally reached Pickhandle Lake, which turned out to be a particularly scenic place to take a break. We were really fortunate to spot no apparent damage to the inside or outside of the RV. I didn’t even mind the dirt and mud. As soon as we got back on the road, we reached another construction zone. Oh no! This one involved a pilot car, but the gravel surface had been graded so it was relatively smooth. Before too long we reached the Canada-U.S. International Border where we stopped for a photo op. Customs was a breeze, and the agent even thanked us for making her laugh for the first time that day. I suggested that we stop at the first campground we could find, and that is exactly what we did. I wanted to give Tim a break after his exhausting day at the wheel, and I had hoped we could find a campground with TV and WiFi at the site. That was a pipe dream, but Border City Lodge and RV Park seemed good enough so we pulled in and finally got off the road. After doing a bit of reading, I have learned that the section of highway on which we just drove is the worst part of the Alaska Highway. It is today, and it always has been. Engineers have yet to find a way to deal with the permafrost and glacial soil that makes roadbuilding so challenging. We passed a portion of the Alaska Highway Permafrost Research Project, which is testing specialized construction techniques. I hope they are successful. 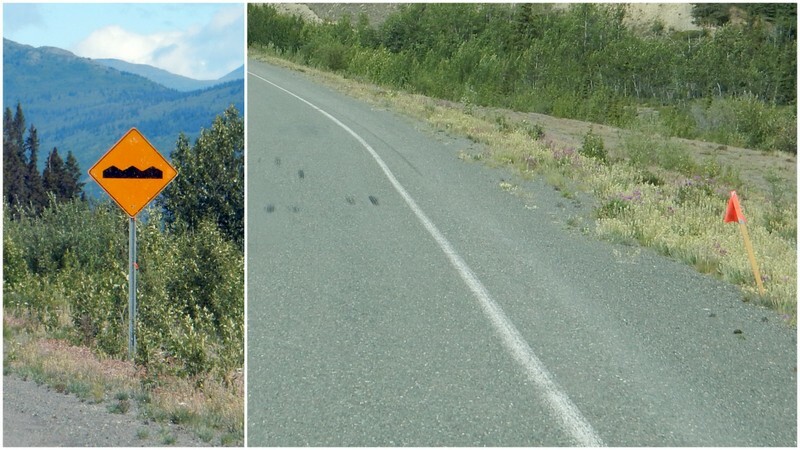 This post is not meant to scare RVers from driving the Alaska Highway. Most of the road is in relatively good condition if you drive at an appropriate speed. The section that we just drove will likely be paved by the end of the summer. Just take the necessary precautions, secure everything in your RV, including your pets, and take your time. After our eventful day yesterday, we slept in and awoke to rain. As we were debating what to do today, we spotted a fox outside our rear windows. We decided on the spur of the moment to drive only as far as Tok, just under 100 miles away. Unfortunately, the weather obscured much of our view as we passed through the Tetlin National Wildlife Refuge, but we did see a few trumpeter swans along the way. The highlight of the drive was spotting a mama moose and her youngster in the grassy area beside the road. There was no traffic, so we were able to stop and watch them for several minutes. They didn’t seem to mind our presence. Tim and I arrived in Tok, took care of a few chores and made our way to the Sourdough Campground just outside of town. The campground had come highly recommended, and we were delighted with what we found. The layout and setting reminded me more of a public campground than a typical private one. The campsites are huge, very private and set among lots of tall trees. There is an onsite restaurant, and the new owner’s specialty is reindeer chili in a sourdough bowl. It was delicious. Tim and I even participated in the campground’s sourdough pancake toss after dinner, which was highly unusual for us. The owner invites everyone for a silly, but amusing, game, and most people end up participating. The goal is to toss a limp pancake into a “buckit,” and the audience is required to clap and cheer. Although Tim and I failed in our toss, we made a valiant effort. I think we were a bit surprised that we actually enjoyed ourselves. This road experience is exactly why John refuses to take our MH to Alaska. I just can't imagine how everything stays attached with the washboard. I was worried our microwave would fall down on the Oklahoma roads! And with a full panorama windshield, replacement can be expensive. So...when we decide to make this trip, we are now thinking of following the Technomads plan with a cruise, train ride, and then a rental RV. But I am enjoying following along with you:) Love that mama moose and baby!! I certainly can understand John's hesitation, but if you made it through Oklahoma, you should be fine in, and on the way to, Alaska. Several Alaskans have proudly stated that their roads are better than those in Oklahoma! The Technomads plan would also work well for you, plus you could likely spend much more time in Alaska. If you decide to go that route, you might want to check into the smaller, adventure-type cruise ship companies and see if they do one-way cruises. They are much more expensive, of course, but I'm guessing that you would enjoy the experience a lot more. We lost our water pump on that stretch, though I am pretty sure it was marginal before then.Honestly, other than that stretch and a few construction zones (Palmer, Seward), the roads are really good. We met worse in Louisiana. And, since you are about three weeks behind us, much of the construction will be done by the time you get here... the chili was pretty good wasn't it? 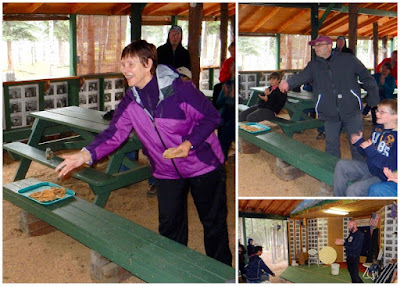 We should have done the pancake toss - looks like great fun! I agree with your assessment about the roads. Except for that horrendous gravel/washboard section, we've found the roads to be a bit annoying, but easily manageable if you just slow down. It was because of your recommendation that we stopped at Sourdough Campground. I wish we could have stayed longer. Although there is no view, it has had the nicest sites of any private campground we've stayed in - it was so nice not to camp on a gravel lot for a change! Slowing down ... that's the key. I've walked on permafrost and know how spongy it can be. And then to put a road on it ... and heavy vehicles. No wander it becomes so washboardy. I'm not going to let this scare us off from doing the drive, but I do often think that we should maybe wait until we downsize our rig ... even though I know many have traveled to/from Alaska in their 40-footers. Slowing down is definitely the key. Driving a well-built rig, like yours, helps tremendously. I don't think some of the rigs put together with staples made it in one piece. We did see many 40-footers, and they seemed to be doing just fine.